During our time in the digital industry, we’ve seen many Kiwi businesses who have tried to handle their own Google AdWords campaigns without the help of a Search Engine Marketing (SEM) or a Pay-Per-Click Specialist. We can understand why many business owners would take the initiative to do it themselves instead of recruiting an agency, I mean why pay someone else to manage it when you could use those funds towards your advertising budget and manage it yourself? The answer here is probably the same answer you’d give to a customer. For example, if you’re a roofing company, you’d probably avoid telling a homeowner with no experience to put up their own roof, or if your a law firm, you’re unlikely to tell someone to manage their own case after being injured at work; and this isn’t because of your best interest, it’s more than in both these instances, these are ways where attempting to save money will actually cost you more in the long-run. While a select few do a good job of running smart and efficient campaigns, the vast majority of Kiwi businesses are more likely to be wasting marketing budget and missing out on potential new clients and return on investment from not running paid campaigns efficiently. With more and more businesses signing up to some sort of Google Advertising each day, competition amongst all industries is becoming extremely tough, so unless you have someone that really knows what they are doing when managing your campaign, you may not see the results you’re looking for. Running a Google Adwords campaign and running an efficient and successful one are two very different things. So, now that we’ve established that getting someone who knows how to properly manage your Ads is essential, should you hire someone full-time? The other disadvantage of hiring someone in-house is that your average SEM manager is not going to be able to compete with agencies who have many more assets available to them to help maximize the efficiency of campaigns, such as advanced software, keyword planning and research tools, web designers, programmers, CRO (conversion rate optimisation) experts and experienced Digital Marketers who manage many campaigns on a daily basis that helps them understand what works and what doesn’t work, and who also usually have direct access to Google. 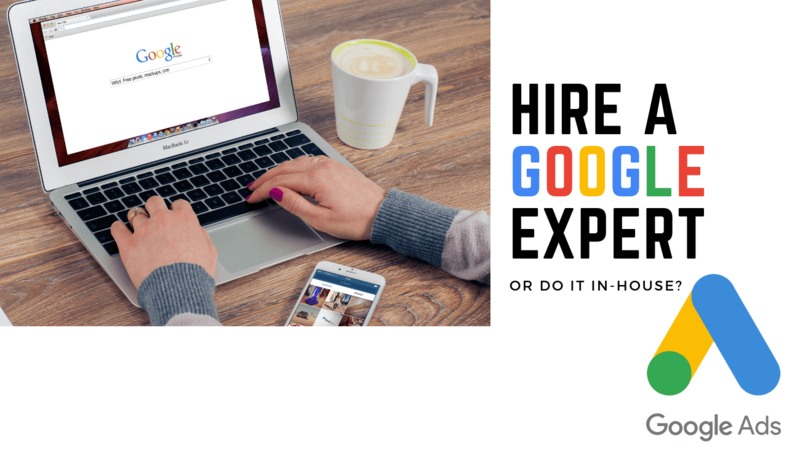 Whatever agency you choose, ensure they have Google Advertising experience and their staff are Google Certified, i.e. have their Google Qualifications. Secondly, it’s best to go with an agency who have good digital knowledge and experience in SEM, Search Engine Optimisation (SEO), web design, CRO and preferably programming, as you’ll find that the more successful your campaigns become and the more different campaigns you want to experiment with, the more technical and design savvy you need to be, which is why it’s good to have an agency who have employees who specialise in lots of various digital aspects. Whether you’ve already jumped the gun and have a campaign set-up but you’re not seeing the results you want, or you haven’t yet created a campaign, then get in touch with Strategus Digital today to discuss your Digital and SEM Strategy.